I stopped by the set of Grocery Store Action Movie to shoot some stills and test out my new 50mm-200mm lens. I had a great time and stayed much later then I expected. 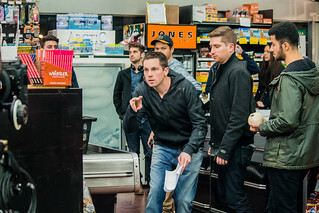 This was the short film Grocery Store Action Movie for the Crazy8s contest. I really enjoyed being able to get in close to the action without actually getting in the way. I will definitely be bringing that zoom lens to more set photography gigs. The next week Mat returned the favor by stopping by my show Between 2 Pints as a guest and we talked about his short film.